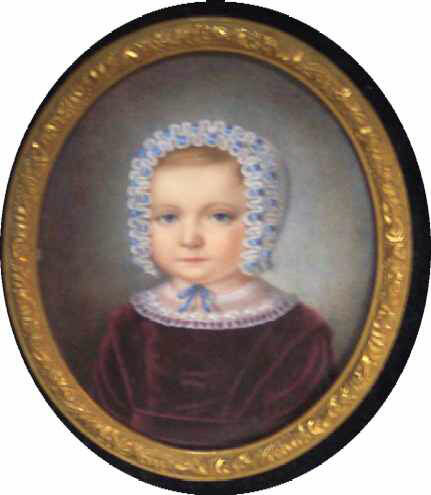 Charming Watercolor Portrait on card of a young child in a burgandy velvet dress and white cap laced with blue ribbons, circa 1810-30. 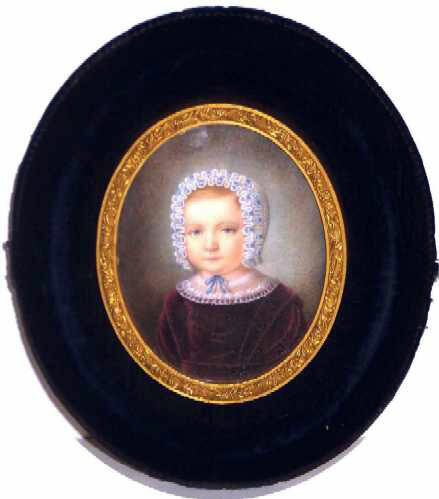 The portrait is surrounded by a gold dore` oval liner and a dark blue velvet frame which does show some light wear on the high part of the frame from handling. (It shows as a bit lighter blue in the picture above.) The whole is very endearingly rendered. The overall size is 6"wide x 7"high, while the portrait itself is 3" wide x 3-3/4" high. Imagine how hard it must have been for her to sit still and pose for the artist while this wonderful watercolor was painted. Such a serious look for one so little. The pictures simply do not do this piece justice. This one is fabulous and is a fine example of the work of a true artist.